This page provides a collection of datasets obtained through the SocioPatterns sensing platform. These datasets contain the temporal network of contacts between students in a high school in Marseilles, France. The first dataset gives the contacts of the students of three classes during 4 days in Dec. 2011, and the second corresponds to the contacts of the students of 5 classes during 7 days (from a Monday to the Tuesday of the following week) in Nov. 2012. Each Contact list file contains a tab-separated list representing the active contacts during 20-second intervals of the data collection. Each line has the form “t i j Ci Cj“, where i and j are the anonymous IDs of the persons in contact, Ci and Cj are their classes, and the interval during which this contact was active is [ t – 20s, t ]. If multiple contacts are active in a given interval, you will see multiple lines starting with the same value of t. Time is measured in seconds. Each metadata file contains a tab-separated list in which each line of the form “i Ci Gi” gives class Ci and gender Gi of the person having ID i. This dataset contains the temporal network of contacts between patients, patients and health-care workers (HCWs) and among HCWs in a hospital ward in Lyon, France, from Monday, December 6, 2010 at 1:00 pm to Friday, December 10, 2010 at 2:00 pm. The study included 46 HCWs and 29 patients. The file contains a tab-separated list representing the active contacts during 20-second intervals of the data collection. Each line has the form “t i j Si Sj“, where i and j are the anonymous IDs of the persons in contact, Si and Sj are their statuses (NUR=paramedical staff, i.e. nurses and nurses’ aides; PAT=Patient; MED=Medical doctor; ADM=administrative staff), and the interval during which this contact was active is [ t – 20s, t ]. If multiple contacts are active in a given interval, you will see multiple lines starting with the same value of t. Time is measured in seconds. This dataset is part of our study of contact networks in a primary school, as reported in the paper High-Resolution Measurements of Face-to-Face Contact Patterns in a Primary School. The dataset comprises two weighted networks of face-to-face proximity between students and teachers. For each day of the study, a daily contact network is provided: nodes are individuals and edges represent face-to-face interactions. 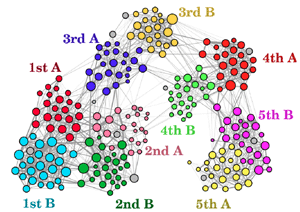 Nodes have two attributes: classname that indicates the school class and grade of the corresponding individual, and gender. Teachers are all assigned to the “Teachers” class. Edges between A and B have two weights associated with them: duration, which is the cumulative time spent by A and B in face-to-face proximity, over one day, measured in seconds (multiples of 20 seconds); and count, which is the number of times the A-B contact was established during the school day. The networks are provided as two GEXF files, one per day of the study, which can be loaded directly into Gephi. These GEXF files contain the same data provided in the supplementary information of the paper above.